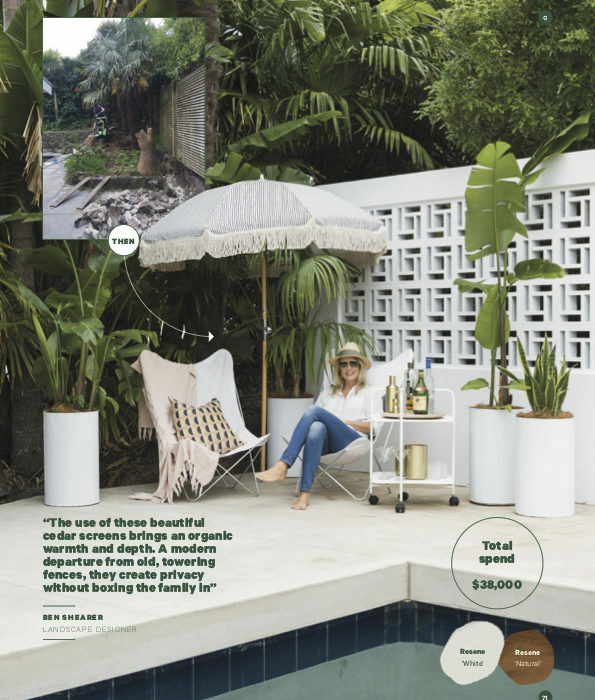 YOUR HOME & GARDEN ASK: WHAT’S A GARDEN RENOVATION COST? 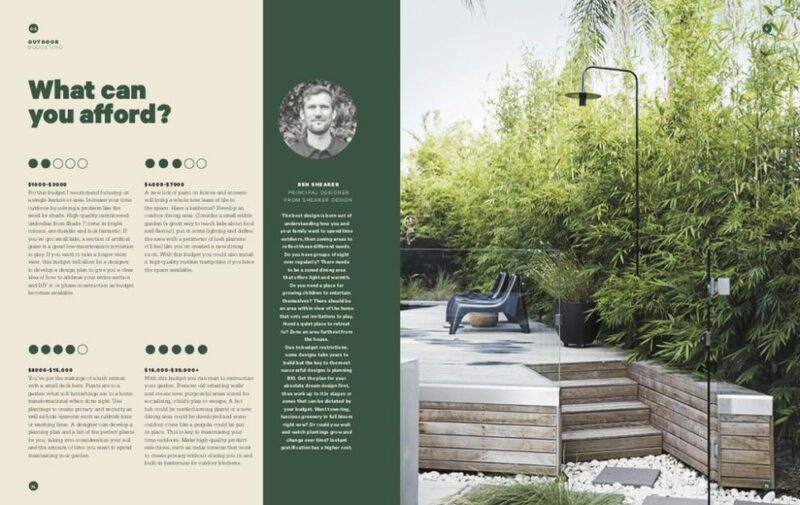 A special edition of Your Home & Garden saw principal designer Ben Shearer inspire homeowners & demystify the costs behind entry-level garden renovation and design. For this budget, I recommend focusing on a single feature or area. Increase your time outdoors by solving a problem like the need for shade. The high-quality cantilevered umbrellas from Shade 7 come in bright colours, are durable and look fantastic. If you’ve got small kids, a section of astroturf is great low-maintenance invitation to play and kind on little (and big!) hands and feet. Beware plastic playhouses: they always end up becoming an eyesore and kids loose interest – build with wood and you can continue to add bells and whistles over time. A new lick of paint on fences and screens will bring a whole new lease of life to the space. Have a BBQ? Develop an outdoor dining area. Consider a small edible garden (a great way to teach kids about food and flavour), put in some lighting and define the area with a perimeter of lush planters: it’ll feel like you’ve created a new dining room. With this budget you could install a high-quality sunken trampoline if you have the space available. You’ve got the makings of a lush retreat with a small deck here. Plants are to a garden what soft furnishings are to a home: transformational when done right. Use plantings to create privacy and security as well as hide eyesores like rubbish bins or washing lines. A designer can develop a planting plan and a list of the perfect plants for you which takes into consideration your soil and the amount of time you want to spend maintaining your garden. With this budget you can start to restructure your garden. Remove old retaining walls and create new, purposeful areas zoned for socialising, child’s play or escape. A hot tub could be nestled amongst plants or a new dining area could be developed and some outdoor cover (the key to maximising your time outdoors) like a pergola could be put in place. High quality product selections for a small area can be made with this budget: from cedar screens that work to create privacy without hemming you in to built-in barbecues. The best design is born out of understanding how you and your family want to spend time outdoors, and then zoning areas to reflect these different needs. Do you have groups of eight over regularly? There needs to be a zoned dining area that has light and warmth. Do you need a place for growing children to entertain themselves? There should be an area within view of the home that sets out invitations to play. Need a quiet place to retreat to? Zone an area furthest from the house. You don’t have to do everything at once – you can phase construction. Due to budget restrictions, some designs take years to build *but* the key to the most successful designs is planning BIG : get the *plan* for your absolute dream design first, then work up to it in stages or zones that can be dictated by your budget. Want towering, luscious greenery in full bloom right now? Or could you wait and watch plantings grow and change over time? Instant gratification has a higher price tag. Shearer Design specialise in creating urban gardens for families that double their time outdoors, and with one another. 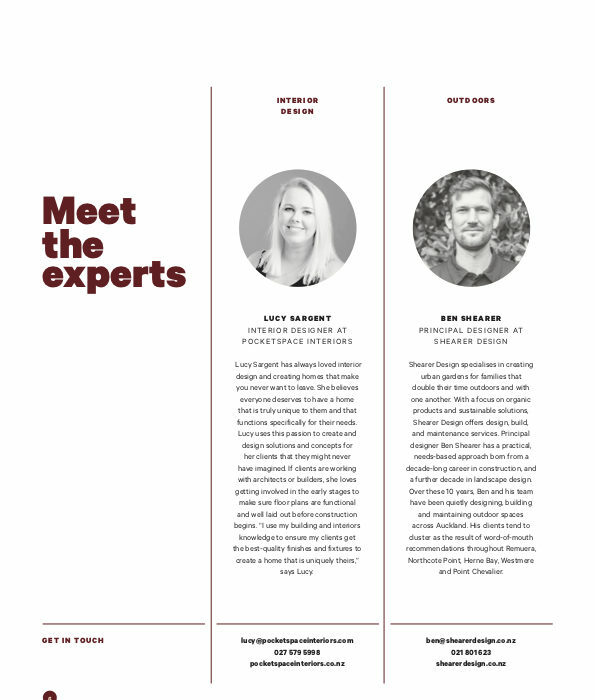 Principal designer Ben Shearer has a practical, needs-based approach born from a decade-long career in construction, and a further decade in landscape design. With a focus on organic products and sustainable solutions, Shearer Design offer design, build, and maintenance services.